Daucus carota or wild carrot, also known as bird's nest, bishop's lace, is a wild flowering plant in the family Apiaceae, native to temperate regions of Europe, southwest Asia and naturalized to northeast North America and Australia where it is known by the common name "Queen Anne's lace". "The plant is named after either Anne of Denmark, queen consort of King James I of England/VI of Scotland, or Queen Anne of Great Britain; both queens made lace as a hobby." Wild Carrot is the ancestor of the domesticated carrots and it is found in sandy or gravelly soils, in wets areas. The plant grows up to 1 m tall, flowering from June to August, with white, lacy flowers. Its stems are erect and branched. Its feather-like leaves are finely divided, arranged alternately on the stem, the same as by domesticated carrot. Both stems and leaves are covered with short coarse hairs. 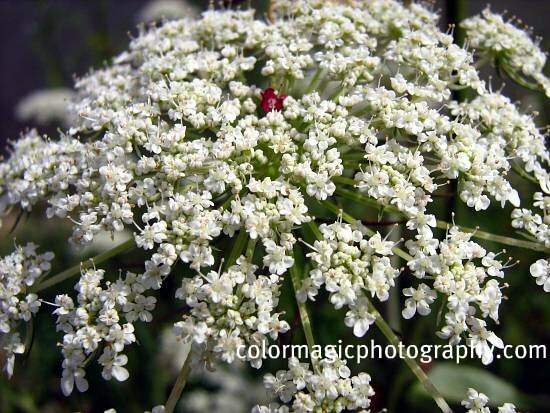 The umbel-shaped inflorescence is produced at the end of the stem, being composed of many individual white flowers and sometimes, a single dark red flower in its center. The umbels are pale pink before they open and bright white and rounded when in full flower, measuring 3–7 cm in width. Beneath the flower there are several drooping, narrow bracts. Usually the plant has many secondary umbels produced at the nodes on the stem below the primary umbel. Spent flower heads (umbels) curl inwards as they turn to seed, they contract and become cup-like, similar to a bird's nest; hence one of its popular names, the "bird's nest." 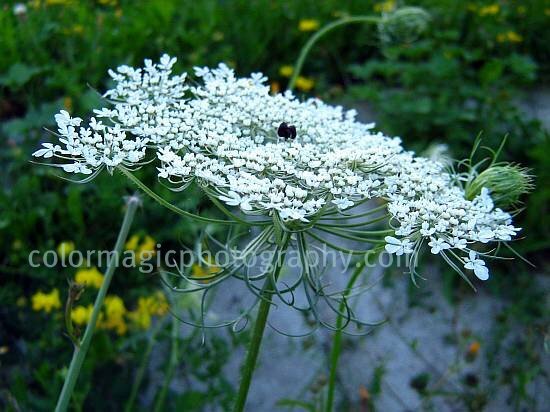 As a medicinal herb, Queen Anne's lace have been used for thousands of years in the treatment of various complaints including digestive disorders, kidney and bladder diseases, in the treatment of dropsy and also helps in the treatment of diabetes. The plant is also used to encourage delayed menstruation, but also has a reputation as a contraceptive. It should not be used by pregnant women as it can induce uterine contractions. Wild carrot leaf tea stimulates the flow of urine and helps to stop the formation of kidney stones. Like their domestic cousins, wild carrot roots are edible while young but they become too woody quickly. For medicinal uses harvest entire plant when in flower, and dry for later use. Collect edible roots in spring when young and tender. Seed are gathered in autumn. Extra caution should be taken when gathering this plant since the wild carrot can be easily confused with its very dangerous relatives from the parsley family like water hemlock (cicuta maculata), poison hemlock (conium maculatum) and fool's parsley (aethusa cynapium), all of which can be deadly. 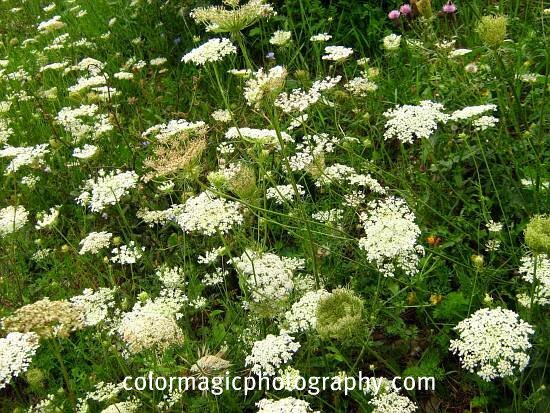 Queen Anne's Lace is one of my favorite wildflowers. Beautiful and informative post. I wasn't aware of the medicinal uses of Queen Anne's Lace, thanks for the information. I just love the additional facts about the medicinal and/or folklore attached to the various flowers. I used to see a plant similar to this as a child but I think it was something else like a weed. You've captured some nice photos of it.